In 1928, the Capitol Theatre opened its doors on State Street. Designed by the renowned Chicago firm of Rapp & Rapp, the Capitol was a marvelous example of the type of opulent movie houses that were built back in the silent film age. Seating 2,500, the theater’s decor had a Moorish/Spanish theme. Uniformed ushers escorted moviegoers to their seats to watch features starring luminaries such as Harold Lloyd and Maurice Chevalier, as well as vaudeville acts like Mae West and Al Jolson. The state of the art building boasted the latest in modern conveniences and, perhaps most wonderful, a Grand Barton theater organ constructed by the Barton Musical Instrument Company of Oshkosh. The Capitol Theater was part of extensive construction and renovation on the 200 block of State Street. 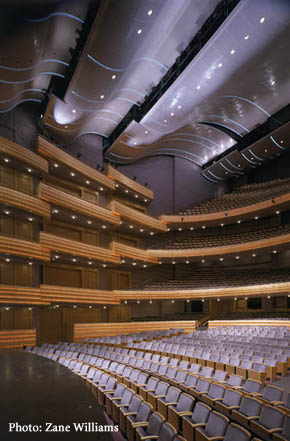 Equipped with the latest in theater technology and renamed the Oscar Mayer Theatre, it was the main venue in a complex that also included the smaller Isthmus Playhouse, meeting rooms, and a Crossroads lobby connecting the performing arts venues with the Madison Art Museum under the same roof. Opening in 1980, the Madison Civic Center was Madison’s home for great arts and entertainment for 23 seasons. Dane County residents were treated to a range of experiences from luminaries like Mikhail Baryshnikov, Kiri Te Kanawa, and Itzhak Perlman, to performances by local arts groups including the Madison Repertory Theatre and the Madison Symphony Orchestra, to free festivals and kids shows in the Crossroads, to the silent film series in which the Grand Barton organ continued to play. In 1998, local businessman W. Jerome Frautschi made the breathtaking gift of $50 million for the development of a cultural arts district in downtown Madison. He established the Overture Foundation to solve the space needs of the city’s major arts organizations. Eleven months later, he made the decision that he would donate another $50 million more. At the completion of Phase 1 of construction, the announcement was made that Mr. Frautschi had spent an astonishing $205 million to build this state of the art facility. Internationally famous architect Cesar Pelli was engaged to design the project. It was a challenge to design and construct the facilities within the constraints of a city block in the center of town, but the team has been up to it. Now complete, the facility contains the fabulous Overture Hall, the intimate Playhouse, three black box spaces, the Madison Museum of Contemporary Art, the Wisconsin Academy’s James Watrous Gallery, three community galleries, a soaring glass lobby, and the Capitol Theater, returned to its original name.